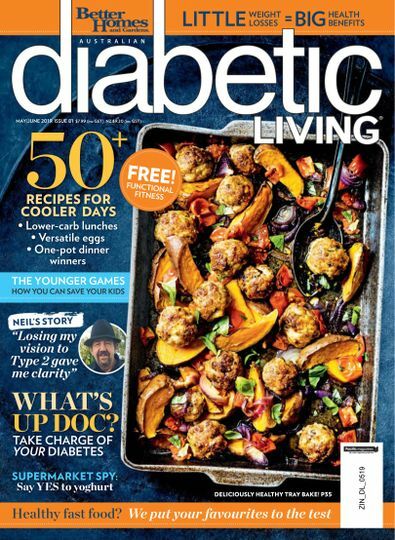 Subscribe to Diabetic Living magazine for 12 months & save 23% off! Offer expires midnight 16.05.2019. Available to AUS residents only. Offer applies to 12 month subscriptions only. Diabetic Living is the only magazine of its kind wholly dedicated to supporting diabetics and their carers. Packed with day-to-day information, research, relevant articles and expert advice, it empowers readers to take charge of their health, arming them with all the tools they need for a full and active life. As dietary changes are often the first step in diabetes management, you’ll find over 40 original, mouth-watering recipes in every issue that have been specifically developed and tested to meet dietary guidelines - plus loads more nutritional info and targeted food advice, all designed to help you achieve your health goals – without sacrificing taste or pleasure. Great mag to keep up with new technology and great recipes. This magazine is great! Fantastic amount of information for new and existing diabetics. I would like to order back issues, how do I do this? I think the magazine is great. I would like to order back issues. How do I do this. I have issues 3 and 4.